Back: Mr Roland Blanks (coach), Shabeer Kahn, Luke Hall, Jaryd Laughton, Linda Ndlovu (capt), Cian Robertson, Luzandre More, Mr Mike Bechet (coach). Front: Levert Manje, Braydon Hicks, Nhlanhka Mashigo, Bredyn Schaper, Joshua Taylor. The 1st cricket team ended the 1st half of the 2018/9 season off on a high note by beating St Stithians by 80 runs in the last game of the year. It’s been a good year for the team. In this half of the season they played 18 matches and won 12 of them. The losses were to Wits University in a warm up game and to Hilton and Westville at the Michaelmas Festival. The victories included wins over St John’s, St Alban’s, St David’s, St Benedict’s and St Stithians. Looking at the year as a whole, there were 31 games played in all, with 19 wins, six draws and six losses. 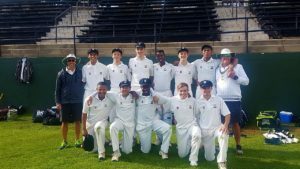 They beat St Stithians in the first term as well – it’s been a long time since that last happened – and their only losses in the early part of the season were to St Alban’s, St John’s and KES. The team was rewarded with the selection of seven players for the various Central Gauteng Lions provincial teams. Linda Ndlovu and Kgaudise Molefe are in the under-19A team, Matthew Van Dyk is in the under-19Bs, Levert Manje and Nhlanhla Mashigo are in the under-17A team and Braydon Hicks and Breidyn Schaper are in the under-17B team. As far as individual performances are concerned, Breidyn Schaper did best with the bat. He made 847 runs (one hundred and five 50s) at an average of 40,3. Also on 40,3 is Matthew Van Dyk who made 564, but played fewer games than Schaper. The bowling figures are headed by Kgaudi Molefe who took 30 wickets at an average of 10,2. Cian Robertson took 30 wickets at and average of 16.6 and Jared Laughton took 25 at an average of 20,7. A tidy performance from team largely made up of youngsters who will be back next year. They are still on track in the Johnny Waite Knockout competition and things are looking good for the second half of the season next year.